Manpuku is a popular Japanese BBQ restaurant which opened in Japan over 60 years ago. They are all about “serving the tastiest meat” so that customers can enjoy the real taste of meat. We’re a family of beef lovers and have always been seeking out good Japanese or Korean BBQ places. Since my sister was celebrating her new job, she wanted to treat us to something more special and one that we haven’t tried. It was a toss between Tamaen or this one, but we ended up at Manpuku Torrance because of timing and the fact that it came from Japan. This was the best Japanese BBQ I’ve experienced. Unlike other places where I would end up sticking to one type only, we selected eight beef dishes from the Yakinuku menu and all of them were just so full of flavour, marbled, tender and amazing! Obviously the Kobe Beef dishes is still the best, but you can’t go wrong with the Marinated Beef as well especially when eating on a budget. Their short ribs in Marinated Beef section were all very good from what we tried. 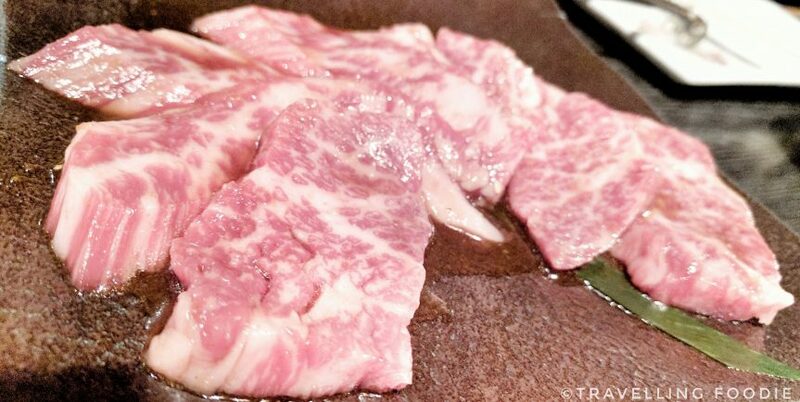 Travelling Foodie Tip: the Kobe Beef finger Meat ($10.5) is probably the best value in the list because it is probably the cheapest amazing Kobe Beef you can get, and it’s also cheaper than the non-Kobe dishes! We also tried their popular Manpuku’s Leek and Tongue with Salt which consists of choicest Tokyo Negi, choicest pepper, and choicest beef tongue. However, this was probably the most disappointing in everything we had as the tongue was sort of tough and rubbery unlike all the other beef. Traveling Foodie’s Favourite: If there’s one thing you absolutely must try here, it’s the Zabuton. This is only available in the Torrance location according to the server. It’s also only $5 which is much cheaper than sushi. Zabuton is from the side of the beef shoulder rib eye. It’s a rare cut where only a few kg are taken from one cow. Then it’s prepared with a little special sweet sauce and grilled lightly by the server table side. It’s then completed by bathing its in a beaten egg yolk and wrapped around small rice ball. Have you been to Manpuku Torrance before? What did you think of the meat? Posted on January 25, 2017 by Travelling FoodiePosted in California, Food, Torrance, USATagged restaurants.